On the highway. Oh look, there’s the exit to HEB. I need fruits. Inside HEB. Wow, from now till I get home, I’ll be super hungry. Maybe I should get something to snack on. 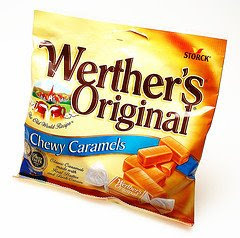 Ooh, I haven’t had Werther’s Original Chewy Caramel candies in a minute! Inside Car: I’ll just have one. Reading nutritional facts. Wow, 6 pieces only 5 grams! Cool. I’ll just have 6 then. Now Driving. First piece. Yikes, stuck my teeth together. Note to self: Buy anti-cavity mouthwash. Fourth Piece. This is good. 6 pieces will definitely do the trick. Done with Sixth Piece. Reaching for 7th. Wait, what? 10th piece. Heh. What was I thinking denying myself something so good? Back at home. 12th piece. I swear I can feel the endorphins being released. 15th piece. Ow, felt that zing. I’ll transfer candy to other side of mouth. Much later. Last piece. Oh my God. But then, considering there are 4 servings, it comes down to only 20g of fat consumed. That’s like the usual semi-large chocolate bar! Right? Except this tastes way better! And fear of your teeth rotting will keep you from doing this often! I’m going jogging first thing in the morning. I guess he chose to die? It's 2001 again... To bush or not to bush?